I just happened to catch The Martha Stewart Show yesterday. I was surprised to see that the topic of the show was blogging. 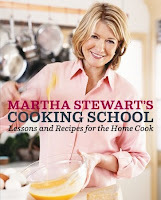 Martha has her own blog where she discusses the topics on her show, behind the scenes, her dogs, etc. Still, I was surprised to see a whole show devoted to blogging! Perez Hilton was one of her guests and I found his segment the most informative. He blogs 12 hours a day! That's way more than a full time job but he makes a living from it. I don't think I could do that. When I think of the time I spend blogging though, I really wish I was getting paid. LOL! Oh well, for now the books I get to read are enough. Most of the guests were blog big-wigs like the founders of cuteoverload and A Year of Mornings who turned their blogs into calendars and books. I have to say, sometimes when I hear about these things I think, "Why didn't I think of that?" Who would have thought a blog of animal pictures and morning breakfasts would have been so successful? Anyway, I've requested MS's Cooking School for review. I really hope I get it because if anyone needs help in the kitchen, it's me. Hi Chris what a great show Martha was about blogging. Can you believe he blogs for 12 hours a day? Wow. I wouldn't mind having a copy of that book myself! Cindy- Yeah, that blew my mind! Kelly- Ha! That's why I have a man that can cook. What a coincidence. If they didn't have to tape the shows a few days/weeks ahead someone could have tipped her off to BBAW!